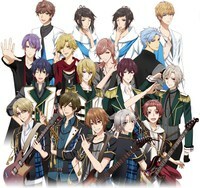 Plot Summary: Tsukipro is a (fictional) production group managing a variety of up-and-coming bands, such as SolidS, which debuted three years ago and has enjoyed a lot of success. Last year they held a major concert for many of their groups, and they plan to do so again this year – only they're thinking bigger. The show will be at Budokan, a major music venue, and it will mark the debut live performances for several of their newer boy bands. SolidS will be singing too, of course, and the pressure's on them even more because they're looked at as the seniors of the agency. They can't afford to get shown up – so when SolidS’ leader and songwriter appears to be overwhelmed by the opportunity to the point of spacing out at meetings and not getting their required four new songs written, his bandmates begin to panic. SolidS will have to pull through if they don't want to be shown up by newer groups QUELL, Growth, and Soara.